The Ghost Nebula is a reflection nebula that has several stars embedded within the nebula. These stars give the nebula an eery brown color. The nebula itself consists of numerous Bok globules - areas where the dust and gas is condensing to form protostars. 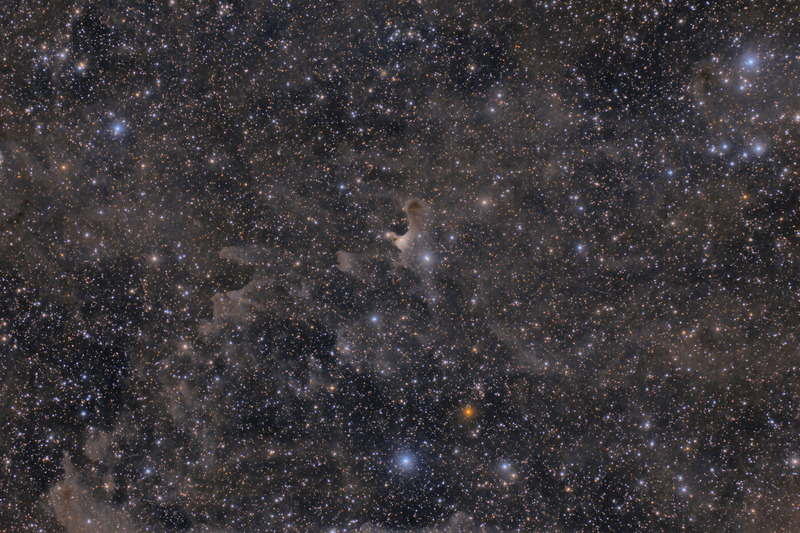 The dark nebula to the upper right of vdb 141 is LDN 1435. Within this nebula is a Herbig Haro object known as HH 157 which is probably a binary star system in formation. Also known as Sh2-136, the Ghost Nebula is about 2 light years across and 1200 light years away. The surrounding nebulosity is uncatalogued, although these dust clouds are pervasive throughout the constellation of Cepheus. This is a wider field version of this image - I also have a rotated and cropped version of this field of view. In this image, North is to the right. This image is cropped to 85% of the original full frame.